Cravero Gift Set for sale. Buy online at Zingerman's Mail Order. Gourmet Gifts. Food Gifts. 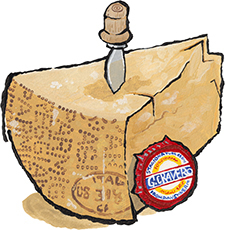 For the cheese lover on your gift list, we've hand cut a huge two-pound wedge from one of Giorgio's exquisite eighty pound wheels and put it in a muslin bag along with one of his company's seals and a classic Parmigiano knife—the kind Italians use to whittle and wedge off irregular chips of parmesan. They nibble after dinner, they nibble as a snack, they nibble whenever they'd like. The cheese lover you choose will do the same. Very limited quantities.